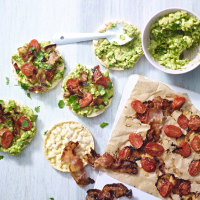 These corn cakes add all the flavour and satisfying crunch of toast, but they’re gluten free, low in saturated fat and a good source of vitamin E. topped with creamy avocado and crispy pancetta, they’re a textural taste sensation. 1. Preheat the oven to 200 C, gas mark 6. Arrange the tomatoes, cut side up, on a baking sheet and lay the pancetta slices on top. Roast for 20 minutes until the tomatoes are tender but still just holding their shape and the pancetta is crispy. Remove from the oven and leave to cool for 5 minutes. 2. Meanwhile, using a large fork, mash together the avocado, garlic and chilli to form a coarse puree. Stir in the chopped coriander and add lime juice to taste. 3. When ready to serve, spread the guacamole onto the corn cakes and top with the warm toasted tomatoes. Crumble over the cripst pancetta and scatter over the extra coriander leaves and a good grinding of black pepper, to serve.